Readings: Genesis 37: 1-4, 12-28; Psalm 105: 1-6, 16-22, 45b; Romans 10: 5-15; Matthew 14: 22-33. May I speak to you in the name of + the Father, and the Son, and the Holy Spirit, Amen. Since last weekend, I have been down to the slipway at Gort in Askeaton a few times, watching the comings and goings at Desmond Rowing Club. At 65, it is 50 years since I first went rowing as a teenager on Lough Ramor in Virginia. In more recent years, I have enjoyed walking along the Backs in Cambridge, watching sculling and rowing on the River Cam. I have even had the pleasure of one college boat club asking to use one of my photographs in a fundraising drive. But I had long thought that I would be left regretting that I had gone to Cambridge as a student too late in life to learn, or to re-learn how to row. I had come to enjoy rowing as a sport and an activity, but in a very passive way. 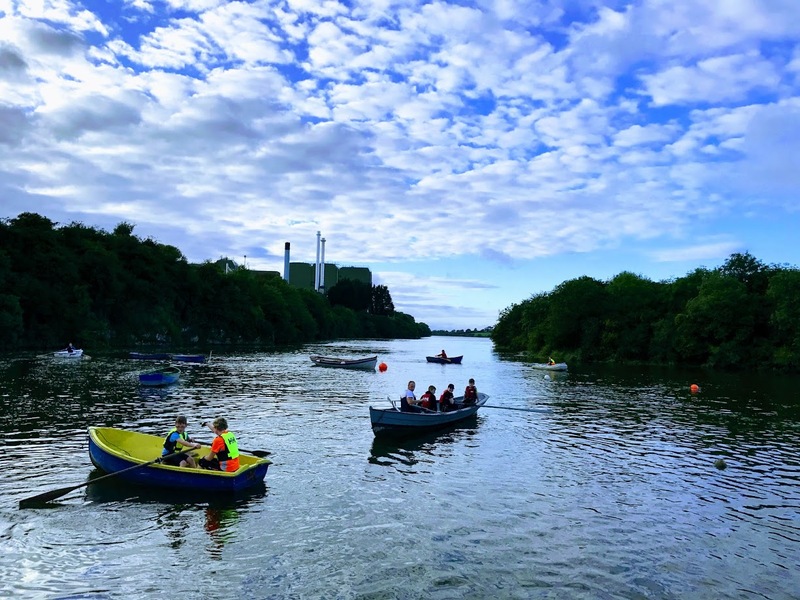 Then one recent evening, as I was standing casually at the slipway at Gort, I was suddenly and unexpectedly invited to get into a boat and started to row. I was fearless. It was a pleasure I had often hoped for and wished for. And for almost an hour, three of us rowed upstream, under the bridge at Askeaton, and as far as the castle, and then downstream past the factory, although not as far as the estuary. When I suggested that I might be too old to learn, I was told brusquely and with humour, that once I stopped learning I had stopped living. Later, in the past week, I have watched children and teenagers hop in and out of boats, freely and fearlessly, confident of their own ability and the ability of those who are training them. Fearlessly. But as we were messing about on boats in Crete last summer, hopping on and off them in the sun as we visited smaller islands and lagoons off the coast, I thought of how this was a pleasure that I was paying for, but how many refugees were full of fear as they boarded boats in the dark trying to arrive on Greek islands, having paid exorbitantly for the risk and the dangers. Fearlessly. What are your worst fears? I know, at present, many of us have fears of a possible nuclear war involving the United States and North Korea. As we grow up and mature, we tend to have fewer fears of the outside world, and as adults we begin to cope with the fears we once had as children, by turning threats into opportunities. The fears I had as a child – of snakes, of the wind, of storms at sea, of lightning – are no longer the stuff of recurring nightmares they were as a child. I have learned to be cautious, to be sensible and to keep my distance, and to be in awe of God’s creation. But most of us have recurring dreams that are vivid and that have themes that keep repeating themselves. They fall into a number of genres, and you will be relieved to know if you suffer from them that most psychotherapists identify a number of these types of dreams that most of us deal with in our sleep at various stages in adult life. ● Finding myself unprepared for a major function or event, whether it is social or work-related. ● Flying or floating in the air, but then falling suddenly. ● Being caught naked in public. ● Missing a train, a bus or a plane. ● Caught in loos or lifts that do not work, or that overwork themselves. ● Calling out in a crowd but failing to vocalise my scream or not being heard in the crowd or recognised. ● Falling, falling into an abyss. There are others. But in sleep the brain can act as a filter or filing cabinet, helping us to process, deal with and put aside what we have found difficult to understand in our waking hours, or to try to find ways of dealing with our lack of confidence, feelings of inadequacy, with the ways we confuse gaining attention with receiving love, or with our needs to be accepted, affirmed and loved. In our Old Testament reading this morning (Genesis 37: 1-4, 12-28), Joseph is dismissed by his brothers, is seen by his brothers as a threat, because he is a ‘dreamer.’ His perhaps naïve behaviour in his youth is threatening them as the older brothers, the adults. But rather than confronting their fears and dealing with them, they decide to get rid of Joseph – it is another play-out of the constant theme of shooting the messenger rather than listening to the message. We sometimes think of the idealists in our midst as dreamers or day-dreamers. They imagine that things can be done another way, they point to potentials or possibilities, they confront us with our greatest fears. But, like Joseph’s brothers, we often confuse dreams that help us deal with our worst fears and the worst fears themselves. Saint Peter’s plight in our Gospel reading (Matthew 14: 22-33) this morning seems to be the working out of a constant, recurring, vivid dream of the type that many of us experience at some stage: the feelings of drowning, floating and falling suddenly, being in a crowd and yet alone, calling out and not being heard, or not being recognised for who we are. Peter sees Christ walking on the lake or floating effortlessly above the water. At first, he thinks he is seeing a ghost. But then Christ calls to him, and Saint Peter responds. Once he recognises Christ, Saint Peter gets out of the boat, starts walking on the water, and comes towards Christ. But he loses his confidence when he notices the strong wind, he is frightened, and he begins to sink. Was the sight of Christ walking on the water an illusion? Was Peter’s idea that he could walk on the water the product of an over-worked mind while it was sleeping? Did he realise he was unprepared for the great encounter? Did the wind cease when he woke from the dream? All of these questions are over-analytical and fail to deal with the real encounter that takes place. Even before the Resurrection, in his frailty, in his weakness, in his humble humanity, Saint Peter calls out to Christ: ‘Lord, save me’ (verse 30). Do the others in the boat fall down at Christ’s feet and worship him because he can walk on water? Because he can lift a drowning man out of the depths? Or because they recognise that in Christ they can find the end to all their worst dreams and nightmares? Saint Paul almost chides us for these questions, reminding us that people have a variety of experiences that help them to grow in faith (see Romans 10: 10). In the sunshine this past week, the waters on the River Deel have been calm, the sun has been shining (mostly), and on most days there were few clouds in the sky. But, in this come-and-go summer, we know too, as they say, to expect the unexpected. On a few occasions, black clouds have moved across the river. The weather could have turned, the waters could have become choppy, and this can be a frightening experience, even on the River Deel, close to the river bank and close to firm land. As seasoned boat-handlers, the Disciples know not to try walking on water. They know the risk of sudden storms and swells, and they know the safety of a good boat, as long as it has a good crew. But since the early history of the Church, the boat has symbolised the Church. The bark (barque or barchetta) symbolises the Church tossed on the sea of disbelief, worldliness, and persecution but finally reaching safe harbour. Part of the imagery comes from the ark saving Noah’s family during the Flood (I Peter 3: 20-21). 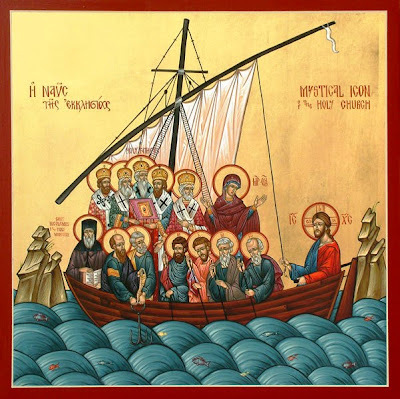 Christ protects Peter’s boat and the Disciples on the stormy Sea of Galilee (see also Mark 6: 45-52; John 6 16-21). The mast forms the shape of the Cross. It is an image that appears in Apostolic Constitutions and the writings of Tertullian and Clement of Alexandria. We still retain the word nave for the main part of the church, which, architecturally often looks like an up-turned boat. So, this morning, I do not want any of us to risk walking on water, or to play stupidly in boats on the River Deel or in choppy waters or storms on the Shannon Estuary. But if we are to dream dreams for our parish, for the Church, for the Kingdom of God, we need to be aware that it comes at the risk of feeling we are being sold out by those we see as brothers and sisters, and risk being seen as dreamers rather than people of action by others: for our dreams may be their nightmares. If we are going to dream dreams for our parish, for the Church, for the Kingdom of God, we may need to step out of our safety zones, our comfort zones, and know that this comes with a risk warning. And if we are going to dream dreams for our parish, for the Church, for the Kingdom of God, we need to keep our eyes focussed on Christ, and to know that the Church is there to bring us on that journey. Let us dream dreams, take risks for the Kingdom of God, step outside the box, but let us keep our eyes on Christ and remember that the boat, the Church, is essential for our journey, and let us continue to worship the Lord in the beauty of holiness. Almighty God, who sent your Holy Spirit to be the life and light of your Church: Open our hearts to the riches of his grace, that we may bring forth the fruit of the Spirit in love and joy and peace; through Jesus Christ our Lord. (Revd Canon Professor) Patrick Comerford is Priest-in-Charge of the Rathkeale and Kilnaughtin Group of Parishes. This sermon was prepared for Sunday 13 August 2017. 9.30 a.m.: Castletown Church, Kilcornan, Co Limerick, the Parish Eucharist. Holy Father, who gathered us here around the table of your Son to share this meal with the whole household of God: In that new world where you reveal the fulness of your peace, gather people of every race and language to share in the eternal banquet of Jesus Christ our Lord.